Alejandra Herrera (Gorton HS), Alexander Nasrallah (Briarcliff HS) and Kevin Reyna (Valhalla HS) were named to the Mid-Hudson Conference All Academic Team for the Fall 2017 semester. The Cross Country team in their first year were the Mid-Hudson Conference Champions. The Mid-Hudson Conference has named Kaan Basyurt (Eastchester), Matthias Bogarin (Mamaroneck HS), Tobias Clarke (Irvington HS), Crysfarrakhan Kapio (Mamaroneck), Mateo Piragua (Peekskill HS) and Manual Tejeira (Ossining HS) of the Westchester Community College soccer team, to the Fall 2016 All Conference Academic Team. Rachel Mendes (Carmel, NY), Silvana Frangaj (Valhalla HS), Willdanelis Hernandez (Riverdale Kingsbridge Acad), Andrea Huanca (White Plains HS), and Ariyan Labela (Marie Curie Acad.) of the Volleyball Team were named to the Fall 2016 All Conference Academic Team. 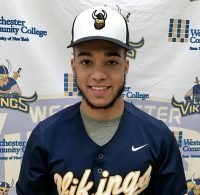 THURSDAY FEBRUARY 23 The Vikings Baseball team opened their season at home today at Silver Lake Park against the Tigers of Queensborough Community College. In what was to be a double dip, WCC beat QCC 4-1 in game one. Game two was played until the bottom of the 3rd but halted due to darkness. In game one, Freshman John Reda (Mahopac HS/Mahopac, NY) pitched a complete game in his first college outing. He threw 7 innings of 4 hit ball with no earned runs and 11 strikeouts on the day. Sophomore Felix Camacho (St. Raymond’s HS/Bronx, NY) opened the scoring with an RBI single to score freshman Scott Giordano (Croton Harmon/Croton, NY) in the bottom of the first inning. The score held until the 5th when QCC got on the board scoring a run on a fielder’s choice. February 25, 2017 – West Harrison, NY… WCC’s baseball team took advantage of the early spring to get in a four game set vs. Manhattanville College. On Friday, the teams split a double header with the Vikings winning 3-2 in game one then falling 5-2 in game two. On Saturday the results were the same as WCC lost game one 6-3 but came from behind twice to take the second game 8-6. Friday’s games featured a walk-off victory for the Vikings. With two outs in the bottom of the 7th inning, the game was tied 2-2. Jose De La Cruz (George Washington HS/New York, NY) hit a clean base hit to plate Scott Giordano (Croton Harmon/Croton, NY) for the winning run after he walked and moved over to 3rd on a Brian Corporan (Environmental Studies/Bronx, NY) single. Triston Olmo (Ardsley HS/Ardsley, NY) started the game and pitched well allowing one run on three hits over five innings. Freshman Luis Gomez (St Raymond’s HS/Bronx, NY) was the pitcher of record notching his first college win. On Saturday, WCC fell in game one by the score of 6-3. After Manhattanville opened up a 3-1 lead early, Brian Corporan scored on a wild pitch to cut the lead to a run. The Vikings were unable to capitalize on a key scoring opportunity in the bottom of the 5th where they had the bases loaded with no outs. The Valiants then scored three runs in the 6th to pull away and though the Vikings plated a run in the bottom of the inning they would get no closer. In game two, Manhattanville again jumped out to an early 2-0 lead, but the Vikings were able to answer with a run in the bottom on the 1st. The Valiants then extended their lead in the 4th to 3-1 but WCC fought right back in the bottom of the inning thanks to an RBI single from Giordano and a bases loaded walk to knot the game at 3. In the top of the 5th Manhattanville took the lead right back with 3 runs to counter. To that point, the Valiant’s first baseman Stephen Merrill knocked in three runs by putting the ball in play in three separate RBI situations with two groundouts and a sac fly. The Vikings kept scratching back though as Felix Camacho (St. Raymond’s HS/Bronx, NY) led off the bottom of the inning with a solo HR. The 6th inning is where WCC finally took the lead for good with Giordano again doing damage with an RBI double to get the team a run closer. Later in the inning, De La Cruz tied the game with an infield single to score Giordano. Brian Corporan then scored on a wild pitch to take the lead. Alex Borman‘s (Huntington HS/Huntington, NY) RBI single would plate De La Cruz before the game headed into the 7th. Coach McClure called on none other than Giordano, who was already 4-4 at the plate for the game to pitch the final frame. He was able to escape a 2-on, 1-out jam to close the door on the Valiants to earn his first save. On the day between both games, Giordano was 6 for 7 at the dish. The series split brings the Vikings’ season record to 3-2 and they return to action on Saturday, March 4th as they host Queensborough CC at 12 noon for a double header at Silver Lake Park. Congratulations to the following schools that the Vikings bowled against this season who have been invited to the USBC COLLEGIATE SECTIONAL QUALIFIERS. Indiana Tech, Molloy, Muskingum, Schenectady, Florida St, and Sacred Heart.